Moya camping out on a cat room shelf during happier times. Jen and I's pre-match routine has become like clockwork as we have several activities that need to be completed before heading to the stadium. Between finding my laptop charging cord, making sure our credentials are packed to plugging in rechargeable photo batteries, there is a flurry of events that need to be completed. However, our activities before the August 4th match with the Philadelphia Union was very different. While we were paying attention to protest events in downtown Portland very closely to calculate out traffic impacts, our minds were very much elsewhere as they have been for several weeks. 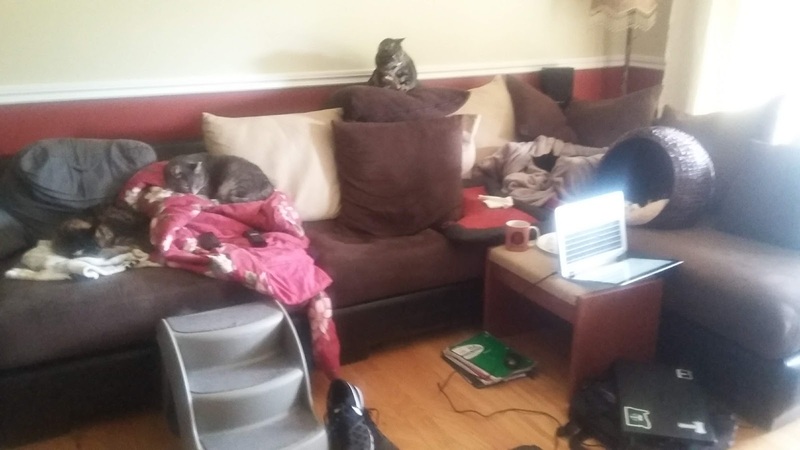 The health and well-being of the members of our cat collective is extremely important, and one of our feline members was dealing with a serious ailment. The match itself provided needed distraction for the moment, especially considering the result extended the Timbers' unbeaten streak to 15 matches. 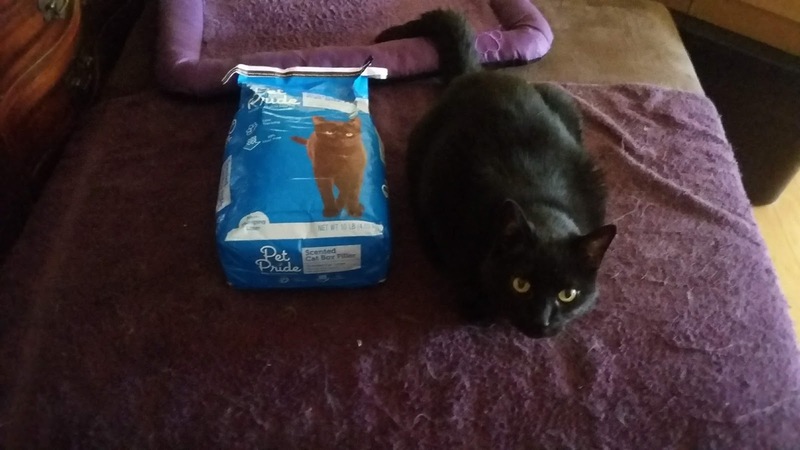 Unfortunately days later, we had to make a very difficult decision to say goodbye to Moya, our beloved black kitty, when it became apparent she wouldn't recover. The issues actually started weeks earlier as people about our neighborhood decided to celebrate the Fourth of July by blowing up small portions of it. While I had heard that cities were going to crack down on illegal firework usage and the legal booths opened up later than usual, that didn't stop folks in the area from setting off several earth shattering kabooms at all hours. Moya was a very sensitive soul to begin with, and she had pica issues - for those not aware of pica, it describes the behavior of eating non-food materials to deal with anxiety - and so we had to keep an eye on her with regularity. When the explosions started, it appeared to impact her appetite no more than in previous years, so as cat owners, we adapted to find other types of food to encourage her to eat. After the passing of the holiday, however, the eating issues continued as other background noises in the area started happening - leaf blowers right after the 7 AM allowed time, construction noises, cars parking in odd locations and making noise at all hours, until at one point, she completely refused to eat anything including the regular late night feeding of Greenies that every cat gets to encourage them to go to bed. Hang out at our house, run into a cat. That's usually how it works about here. We called the veterinarian's office near us for an emergency consultation, and they had an opening available. After a quick exam and blood work, we brought her back to home but she was extremely anxious for the rest of the day. The anxiousness for us took on another level when the vet called with the results saying there were elevated liver enzymes in her system, and the next suggested step was a series of expensive tests. After talking it over with the family, doing extensive research on the Internet and considering our little girl was still incredibly anxious after the vet visit and hiding, we decided to try and deal with the issue at home. We tried many things, including pate', feeding by syringe, liquidy food, and it worked for a while. Until it didn't. We kept trying and monitoring while doing all the fun things she loved doing in the house. Until that didn't work. It was finally time to face the reality that a magic recovery wasn't happening, so we made the decision to say goodbye. I have to give credit to the folks at Oregon Humane Society, who took very good care of us. They asked me a lot of questions, they did a thorough exam, they concurred with the findings and agreed with our decision. At 2:23 pm, I said goodbye to Moya for the last time. I've lived in this house since 2006, and we've lost several kitties over the years and it's never easy to process all the emotions that occur when saying goodbye. However, all of the cats so far have been ones who lived here before I moved in, so they already had people. 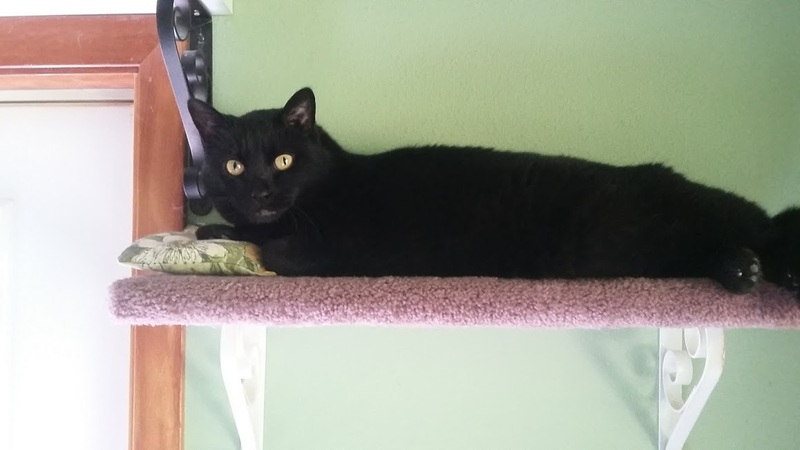 My mother in law got Moya and her brother right after Jen and I came back from our English honeymoon, and she was originally supposed to be for Jen's brother who had always wanted a black cat. That was until Moya chose me and she became my little furry baby. I will never forget the myriad of noises she made, how much she loved the brush, her demands for lap time, and how much she meant in my life. I can still hear her noises about the house, and her brother, Pilot, has been busy searching for her in every room and cat bed. What's funny is that I wander about the house, and I keep hoping that I'll see her laying on her bed, sitting on a shelf, or lying on the floor in a sunbeam. I know it won't happen, but I still can't believe that she's no longer here either, and even the other cats can feel a difference in the energy here. I hope wherever she ends up has an endless supply of brushes, neck scratches, belly runs and treats because she deserves it; there were plenty of days where I needed a pick me up and she often obliged. Moya was quite the star of several products. Or it was a reasonable facsimile. Especially during the halftime of the Timbers match versus the Union. Without Sebastian Blanco, the offense was completely out of sync. Playing the same formation that worked versus Houston - a 3 center back, 2 fullbacks, 3 midfielders and 2 forwards - against a Philly side that had played midweek and had another midweek match in the U.S. Open Cup to look forward to, the Timbers should have been able to dominate, especially when Union Coach Jim Curtin played several reserves. However, the group actually pushed the tempo and pace and Portland was having difficulty adjusting to the resistance, especially since they really didn't have a true replacement for Blanco's creative skill set. They relied upon the positioning of Samuel Armenteros, the fluidity of Diego Valeri, and the speed of Andy Polo and Alvas Powell to break open the Union defense, but only Powell was able to get forward with any regularity in danger. Portland was the beneficiary of 2 penalty kicks awarded by Center Official Alan Kelly; in the 56th minute, Powell was pulled down in the box by Union defender Fabinho on a run to the right, and Valeri converted the penalty straight down the middle when Union goalkeeper Andre Blake went left, and the 84th minute when Valeri was knocked down by Union centerback Auston Trusty in the box. For penalty number 2, Valeri deferred to Dairon Asprilla for the conversion, and while Blake guessed correctly in going left on the attempt, it was shot so hard, Blake couldn't stop it. David Guzman added a third goal off a Valeri free kick in the 87th minute to give the final result, but honestly, the Timbers turned a second half rally into a comfortable win. The result was somewhat impressive, but considering the emotional layover from the departure of Fanendo Adi, this should have been a more composed Timbers side. It came down again to Gio Savarese's halftime talk and some serious adjustments in intensity, and the Timbers were able to add to their history with another 15 match unbeaten streak. The Timbers pulled off this feat in 2013 during the first year of Caleb Porter's coaching tenure, and it propelled them all the way to the Western Conference finals, but this year's team is not sitting on their laurels one bit. During the summer transfer window, the Timbers made several moves: defender Vytas was sent to D.C. United for allocation funds, Portland sent an international spot to Montreal for current and future allocation funds, and they reacquired 2 players from their 2015 MLS Cup winning side, defender Jorge Villafana and forward Lucas Melano. While Melano's transaction was relatively easy in terms of recalling him from the loan to Estudiantes in Argentina, Villafana's deal required use of the acquired allocation funds plus a separate deal with the Los Angeles Galaxy using other funds to secure the top spot in the MLS Allocation order used to assign U.S. Men's National Team players to domestic clubs when they return to MLS. Diego Chara will have some reinforcements coming for the stretch run. The moves have dramatically upgraded the offense while adding another overlapping option to the defense, and it makes Savarese's job of doling out playing time more difficult. Coaches love this problem because it pushes players to perform each practice to avoid being left on the bench or not in the game day 18 roster. I love what Zarek Valentin has done this year, and his work made Vytas effectively dispensable, but Villafana's pace and crossing ability suddenly adds more danger to the defense and also gives Savarese depth to push Powell. While Melano is no Adi in terms of scoring, Melano has shown well in working seamlessly on the attack during his loan stretch, and if Gio can get further progression in his skills, he could add another dangerous weapon to the Timbers' arsenal. I do appreciate Portland trying to be aggressive in finding options, and if this works out, it could make them extremely difficult to defend during the playoff run. In adding Tomas Conechny as well, Portland has several different options for the now and the future that are intriguing if everything pans out. That's the thing about life is that it's constantly full of change and we all have to say several goodbyes along the way. I'm sad to see Vytas leave, as he really got what it was like to play for the Timbers and had some really good seasons in his time here. 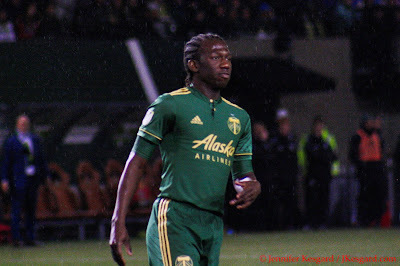 It's also interesting to see 2 players return to the side who really had memorable seasons in 2015 for Portland - Villafana was a massive reason why the Timbers defense was so solid during the stretch, and Melano had several memorable moments during the playoff run. Villafana was traded away after the 2015 season while Melano was loaned out after a disappointing 2016 season where he never could live up to the massive expectations that came with his talent and contract. Both players now get to return to familiar haunts for the playoffs, and it couldn't come at a better time with a difficult stretch of matches coming after the home match versus Vancouver on August 11. I'm excited about the potential, but it's also okay to reminisce about what was. It helps in dealing with the changes better, especially when saying goodbye to a player you like or a black kitty that has meant so much over the years.